Well, let me stop you there. My brother and I were working on a story that we thought would be fun to turn into a screenplay. Of course, every story needs a plot, tension, storyline, and above all a focus. And the cool thing about this story is that it was all TRUE. 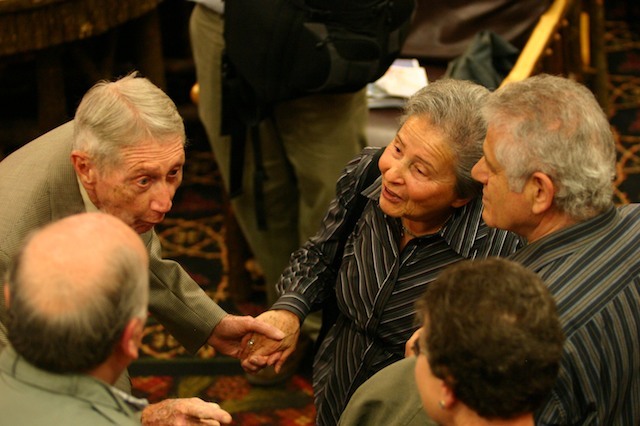 World War II infantry veteran Carrol Walsh, top,meets Holocaust survivors at a reunion in New York State, on Tuesday, Sept. 22, 2009. Walsh’s unit liberated a Nazi train carrying 2,500 Jewish prisoners, some pictured here, from the Bergen-Belsen concentration camp in Germany during the war’s waning days.The reunion came about because of efforts of high school history teacher Matthew Rozell. While there are several protagonists, we settled on a hero, a main character of sorts to follow. My brother asked me why he was my hero. My reply: because he so did not wish to be called one. He was uncomfortable with the limelight-you could tell that with some of the interviews he did. There was always something higher behind how he conducted himself. Like his lifelong friend Dr. George Gross, the appearance of the Holocaust survivors that they liberated on April 13th 1945, I think profoundly enriched his sunset years. Above all I remember his laugh, his chuckling disdain for fools and his engaging talks to young people about what he saw-and what our responsibility as human beings is. My brother said to me- so do you like your main character? No, I replied. I loved him. Carrol passed away yesterday, Dec. 17th, 2012, at 6:05 pm at home with his wife of 68 years by his side. He was 91. In the wake of so much heart breaking tragedy and misery in the world, I am pausing and remembering the actions and life of a single man who would bring to thousands of people so much joy, laughter, and of course life itself, with so much personal humility. He profoundly altered the course of my own life in the short time I was honored to know him. This CBS News short sums up a lot about the man. And the interview that follows was where I took today’s post title from. Just listen to him tell a story. I had hoped to have a few days to reflect on my own loss mentioned in the previous post but as an educator, this has to be brought up. Now. If you are a follower, much of the teaching history matters website is to explore the idea of what it truly means to be an American. What is it that truly defines us as a people? What is it that we truly value? What do we want to pass on to our children? Following the latest horrific tragedy, we are hearing a lot of buzz about having a “national conversation.” And I don’t see where it’s doing kids much good. Kids seem to become more anxious with each passing hour, though the tragedy occurred last week. Now they are in front of you in the classroom. Your job is to explain the world to them. They look to you for answers and solutions, reassurance and comfort. Try walking in a teacher’s shoes this week. Here is some hard earned advice gleaned over working through past school related tragedies, which I offer up to the three teachers who follow this blog. Don’t try to make sense or explain the inexplicable, or offer “solutions”. If a kid is with seven teachers a day, consider “teachable moment impact fatigue” (I think I just coined a new phrase) as well. You still have a lesson planned. Pause, reflect, be human, but carry on. There are more days ahead. On a personal note, consider unplugging the TV for a few days. Trust me, you won’t miss anything. Log off of Facebook, maybe even turn off the smartphone. Say no to death and fear. Breathe. Set the real tone. Just be. Peace. And leave the decorations up, for the kids’ sake and our own. I read this Friday. For me, this lady nailed it out of the gate. In the end there were 38 children dead at the school, two teachers and four other adults. I’m not talking about the horrific shooting in Connecticut today. I’m talking about the worst school murder in American history. It took place in Michigan, in 1927. A school board official, enraged at a tax increase to fund school construction, quietly planted explosives in Bath Township Elementary. Then, the day he was finally ready, he set off an inferno. When crowds rushed in to rescue the children, he drove up his shrapnel-filled car and detonated it, too, killing more people, including himself. And then, something we’d find very strange happened. No cameras were placed at the front of schools. No school guards started making visitors show identification. No Zero Tolerance laws were passed, nor were background checks required of PTA volunteers—all precautions that many American schools instituted in the wake of the Columbine shootings, in 1999. Americans in 1928—and for the next several generations —continued to send their kids to school without any of these measures. They didn’t even drive them there. How did they maintain the kind of confidence my own knees and heart don’t feel as I write this? They had a distance that has disappeared. A distance that helped them keep the rarity and unpredictability of the tragedy in perspective, granting them parental peace. Time and space create distance. But today, those have compressed to zero. The Connecticut shooting comes into our homes–even our hands–instantly, no matter where we live. We see the shattered parents in real time. The President can barely maintain composure. This sorrow isn’t far away, it’s local for every single one of us. And of course it brings up Columbine. Two horrors, separated by years and miles, are now fused into one. It feels like terrible things are happening to our children all the time, everywhere. Nowhere is safe. As a result, I expect we will now demand precautions on top of precautions. More guards. More security cameras. More supervision. We will fear more for our kids and let go of them even more reluctantly. Every time we wonder if they can be safe beyond our arms, these shootings will swim into focus. Will this new layer of fear and security make our children any safer? Probably not, but for a reassuring reason: A tragedy like this is so rare, our kids are already safe. Not perfectly safe. No one ever is. But safe. That’s a truth the folks in 1928 America understood. We just don’t feel that way now. Not when there’s no distance between us and the parents in Newtown. We have to value what our forebears – and not just in the 18th century, but our own parents and grandparents – did for us, or we’re not going to take it very seriously, and it can slip away. From David McCullough. I’ve heard him speak, and I am re-reading “Truman” right now. He needs to be heard again. While in no way comparing my efforts to his, we obviously are on the same wavelength, and like him, I have the same mission. I really think that more people need to “get it”. I’m proud to say that I recently received one of the the same medals as he was awarded in 2003. We are raising a generation of young Americans who are by-and-large historically illiterate. And it’s not their fault. There have been innumerable studies, and there’s no denying it. I’ve experienced it myself again and again. I had a young woman come up to me after a talk one morning at the University of Missouri to tell me that she was glad she came to hear me speak, and I said I was pleased she had shown up. She said, “Yes, I’m very pleased, because until now I never understood that all of the 13 colonies – the original 13 colonies – were on the east coast.” Now you hear that and you think: What in the world have we done? How could this young lady, this wonderful young American, become a student at a fine university and not know that? I taught a seminar at Dartmouth of seniors majoring in history, honor students, 25 of them. The first morning we sat down and I said, “How many of you know who George Marshall was?” Not one. There was a long silence and finally one young man asked, “Did he have, maybe, something to do with the Marshall Plan?” And I said yes, he certainly did, and that’s a good place to begin talking about George Marshall. We have to do several things. First of all we have to get across the idea that we have to know who we were if we’re to know who we are and where we’re headed. This is essential. We have to value what our forebears – and not just in the 18th century, but our own parents and grandparents – did for us, or we’re not going to take it very seriously, and it can slip away. If you don’t care about it – if you’ve inherited some great work of art that is worth a fortune and you don’t know that it’s worth a fortune, you don’t even know that it’s a great work of art and you’re not interested in it – you’re going to lose it. There was a wonderful professor of child psychology at the University of Pittsburgh named Margaret McFarland who was so wise that I wish her teachings and her ideas and her themes were much better known. She said that attitudes aren’t taught, they’re caught. If the teacher has an attitude of enthusiasm for the subject, the student catches that whether the student is in second grade or is in graduate school. She said that if you show them what you love, they’ll get it and they’ll want to get it. Also if the teachers know what they are teaching, they are much less dependent on textbooks. And I don’t know when the last time you picked up a textbook in American history might have been. And there are, to be sure, some very good ones still in print. But most of them, it appears to me, have been published in order to kill any interest that anyone might have in history. I think that students would be better served by cutting out all the pages, clipping up all the page numbers, mixing them all up and then asking students to put the pages back together in the right order. The textbooks are dreary, they’re done by committee, they’re often hilariously politically correct and they’re not doing any good. Students should not have to read anything that we, you and I, wouldn’t want to read ourselves. And there are wonderful books, past and present. There is literature in history. Let’s begin with Longfellow, for example. Let’s begin with Lincoln’s Second Inaugural Address, for example. These are literature. They can read that too. History isn’t just something that ought to be taught or ought to be read or ought to be encouraged because it’s going to make us a better citizen. It will make us a better citizen; or because it will make us a more thoughtful and understanding human being, which it will; or because it will cause us to behave better, which it will. It should be taught for pleasure: The pleasure of history, like art or music or literature, consists of an expansion of the experience of being alive, which is what education is largely about. And we need not leave the whole job of teaching history to the teachers. If I could have you come away from what I have to say tonight remembering one thing, it would be this: The teaching of history, the emphasis on the importance of history, the enjoyment of history, should begin at home. We who are parents or grandparents should be taking our children to historic sights. We should be talking about those books in biography or history that we have particularly enjoyed, or that character or those characters in history that have meant something to us. We should be talking about what it was like when we were growing up in the olden days. Children, particularly little children, love this. And in my view, the real focus should be at the grade school level. We all know that those little guys can learn languages so fast it takes your breath away. They can learn anything so fast it takes your breath away. And the other very important truth is that they want to learn. They can be taught to dissect a cow’s eye. They can be taught anything. And there’s no secret to teaching history or to making history interesting. Barbara Tuchman said it in two words, “Tell stories.” That’s what history is: a story. And what’s a story? E.M. Forster gave a wonderful definition to it: If I say to you the king died and then the queen died, that’s a sequence of events. If I say the king died and the queen died of grief, that’s a story. That’s human. That calls for empathy on the part of the teller of the story and of the reader or listener to the story. And we ought to be growing, encouraging, developing historians who have heart and empathy to put students in that place of those people before us who were just as human, just as real – and maybe in some ways more real than we are. We’ve got to teach history and nurture history and encourage history because it’s an antidote to the hubris of the present – the idea that everything we have and everything we do and everything we think is the ultimate, the best. I just wanted to take a moment to send you an e mail. I was in your Dad’s classes from 1977- 1978 at Glens Falls HS, He was a teacher who inspired learning. Also I was able to earn a pension after many years from the US Army at the Rank of Major. Without good teachers, I never would have accomplished anything. My Dad was a teacher also and he passed away 10 4 2004. Sincerely, Philip M.
Today, Dec. 4th, would have been my dad Tony Rozell’s 81st birthday. He passed away in 2000. Phil’s email above was a reminder. Good timing, Phil! From father to son! About the time you had my dad in the classroom I was trying to figure out how to get away from him, and this town! Dad (Tony) entered the Air Force at the outbreak of the Korean Conflict and quickly rose through the ranks. He was a superior clerk and administrator who served in the war zone and saw death and destruction near the 38th parallel. There is one story Dad used to relate that I really like. In the early days of his service, he was singled out for abuse by a mean-spirited corporal who particularly delighted in bullying the 88 lb. runt from Hudson Falls. Years later, after Tony had proven his abilities and achieved the rank of Tech. Staff Sergeant, this same corporal came to his office to receive his orders. He avoided Dad’s eyes as Dad handed them to him, and Tony asked quietly if the corporal remembered him. The former bully’s eyes darted around the room and back to his feet, as he nervously replied, “No, sir!” With that, Dad nodded and bid his former tormenter farewell without the dressing down he so richly deserved. He could have shipped the guy to Timbuktu. 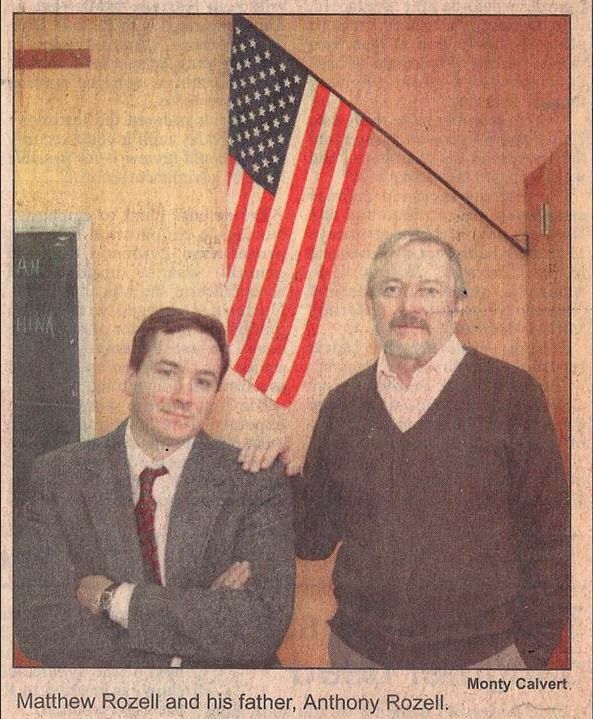 Feb 3, 1992 Glens Falls Post Star story. Captain and the Kid. When history teacher Matthew Rozell was a youngster, his parents made him stay inside all day to watch the first moon landing on television. “I remember being so angry, but I’m glad they did that, now,” Rozell said. Now, some 20 years later, that history lesson and others led the naturally curious boy to follow his father’s footsteps to the head of a history class. Not as a student, but as a teacher. 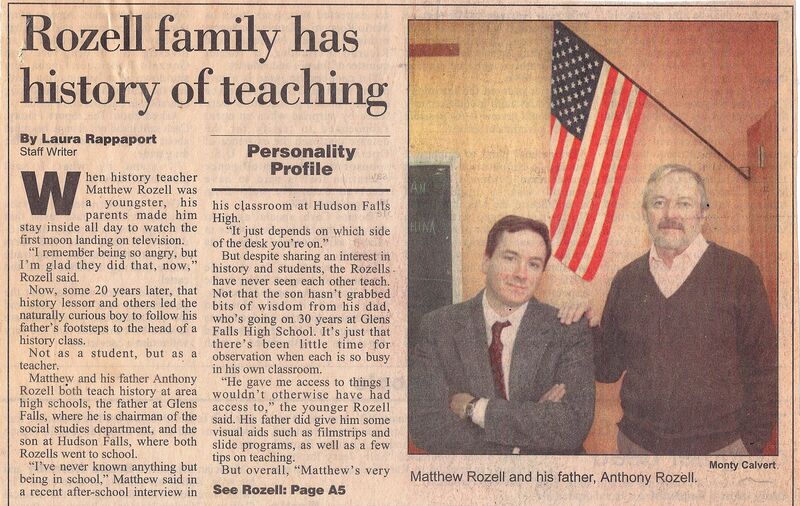 Matthew and his father Anthony Rozell both teach history at area high schools, the father at Glens Falls, where he is chairman of the social studies department; and the son at Hudson Falls, where both Rozells went to school. But despite sharing an interest in history and students, the Rozells have never seen each other teach. Not that the son hasn’t grabbed bits of wisdom from his dad, who’s going on 30 years at Glens Falls High School. It’s just that there’s been little time for observation when each is so busy in his own classroom. “He gave me access to things I wouldn’t otherwise have had access to,” the younger Rozell said. His father did give him some visual aids such as filmstrips and slide programs, as well as a few tips on teaching. But overall, “Matthew’s very independent,” his father said. Maybe so, but the younger Rozell credits his parents with kindling his interest in history by exposing him and his four siblings to it. On trips to Boston and New York City the family would visit the major museums and historical sites. “I was always very interested in what I saw,” said Matthew Rozell, adding that he usually had more questions than his brother and sisters. Also, with a father who teaches summer school, (Anthony taught summers in Hudson Falls for 21 years) it was hard to get away from school subjects – even for a few months. On summer afternoons or evenings, the father might play tapes or show slides of what he was working on in school. “It wasn’t like he would sit and make us watch it,” said Matthew. “I wasn’t enthralled, but at the same time I was exposed to it.” And his parents made sure their kids paid attention to important world events, like the historic moon landing. “He gave me money to go to the newsstand” for the momentous, occasions, Matthew said. The elder Rozell is also a collector who hangs onto magazine and newspaper articles about the big stories of the day. His classroom bulletin boards at Glens Falls are covered with yellowing newspaper pages. His son, now 30, followed a tougher path: jobs were scarce when he finished his teaching degree at State University of New York at Geneseo in 1985. He looked for work in the western part of the state, and even had the opportunity to run a restaurant or become a chef. But Matthew Rozell felt he shouldn’t throw away his education. “I spent too much money on my education to just give it up,” he said. Failing to find a job in western New York, the young Rozell came home to Hudson Falls and stayed with his parents. 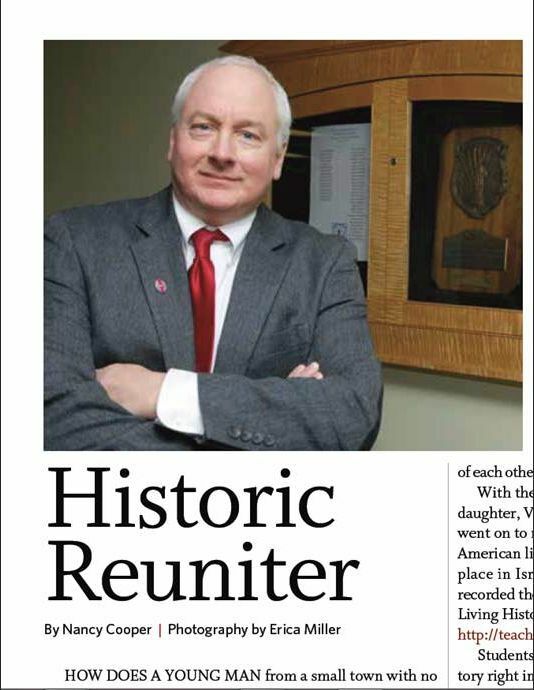 He finally landed his present job – with a little help from dad,.- midway into the 1987 school year after a year at St. Mary’s Academy. He was the third teacher the class had that year, and it was a tough assignment. “When I first came here I was more interested in survival,” he acknowledged. “It’s like throwing a piece of meat to the wolves.” The more experienced Rozell helped his son through some of the rough spots in the beginning, and Matthew Rozell turns to his father less now, in his fifth year teaching. Father and son are close, but they don’t spend a lot of time talking about education and lesson plans. The teachers’ wives may actually have been brought closer together by sharing similar work – in the South Glens Falls Central School District, Matthew observed. His wife Laura teaches special education at South Glens Falls, while his mother, Mary, is the school nurse teacher there. The two women have become very close, and usually go to staff meetings together, according to Matthew. “They like to wear the same outfits on those days and see if anyone will notice,” he said. 21 years on. Article for release Feb. 2013. Dad is gone but spirit is raging. Erica Miller photo. And in the final analysis, said Anthony Rozell, there’s not a lot a father can really teach a son about the profession or art of teaching.